Takeaway: Standing workers are at risk for numerous injuries. These 7 ergonomic aids can help protect worker health and productivity. Human beings are designed to stand. Babies learn to pull themselves up and walk as soon as possible, never to return to crawling. Our skeletons are meant to support our bodies in an upright position, so that we can move easily on our feet throughout the day. However, when someone stands all day in a job, the body can still suffer fatigue. Ergonomic aids for standing workers can help reduce injury and healthcare utilization costs. Standing for work is common for many occupations, such as healthcare workers, sales/retail people, restaurant staff, machine operators, and assembly line employees. According to Maria-Gabriela Garcia, Ph.D., nearly half of workers all over the world spend more than 75% of their workday on their feet. While standing is natural, when it is a regular part of a job assignment or done for extended periods of time, workers frequently complain of lower back and lumbar pain (Learn more in "A Look at Lower Back Pain in the Workplace "), sore feet, swelling in the lower legs and ankles, and varicose veins. Other common conditions include general fatigue and stiffness in the neck and shoulders. Employers hiring workers who will have standing job duties should be aware of potential health hazards for these employees. People who stand have fewer options in choices of body positions and postures, and less opportunity to move freely and rest muscles used during their work. Just five hours of standing can contribute to prolonged muscle fatigue, which continues after the day’s shift is over. In the short term, workers are uncomfortable; however, over time, chronic health conditions can develop, including heart and circulatory disease, varicose veins, back and joint pain, and musculoskeletal disorders (MSDs). Women of child-bearing age can also experience pregnancy complications. Awareness of job requirements and stressors can prevent injuries and maintain productivity. According to the Canadian Centre for Occupational Health and Safety (CCOHS), appropriate measures include the following. Adequate break periods to allow for rest and recovery, as well as reduce the occurrence of MSDs. (Learn more in "Breaks During Work Are Necessary for Employee Well-Being and Work Performance"). Design of the workspace for an employee who stands is extremely important. A classic study by Konz and Johnson showed that maintaining an erect stance requires constant balancing and adjustment. People instinctively sway side to side and back and forth, adapting to gravity. With the entire body being supported by the only the feet, “a standing person is like a tall building swaying in the wind,” states Alan Mozes, a reporter for HealthDay News. Attention to proper ergonomics varies according to the specific job. However, assuring that the most common and reasonable aids are in place can immediately benefit your employees. Anti-fatigue rubber mats should replace concrete or metal floors. A study cited by OSHA reported that floor mats allow “the body to naturally and imperceptibly sway, encouraging subtle movement of the calves and leg muscles.” Do not choose foam-rubber mats; this can actually result in too much cushioning that creates its own risk and is a hazard for falls. Wooden or cork floors can also relieve stress on the feet and musculoskeletal system. Foot rails or foot rests allow workers to shift weight and change position. Even this small ergonomic aid allows for some movement and flexibility, as well as relieving pressure on the spine, hips, knees, and feet. A seat should be provided so that the employee can either stand or sit during the workday and the height should be appropriate for the task. Even if the job requires standing only, the employee needs a seat for rest breaks. Much like desk workers need to be able to change position throughout the day, so do standing workers. (Learn more in "Ergonomics: Everything You Need to Know About Office Chairs"). Workspaces should be arranged to allow employees to move around and reach items without stretching or twisting. Common tasks should be easiest to reach. When performing a task while standing, an employee should never reach above the shoulder line. There should also be plenty of room for the feet, so that the employee doesn’t have to lean forward to work. (Learn more in "7 Ways Ergonomic Workstations Can Improve Employee Productivity"). Employees who stand should wear laced shoes that do not change the shape of the feet, with plenty of room to move the toes. Shoes with arch supports prevent flattening of the feet. Because feet can swell from standing for long periods, shoes may need to be one-half to one size larger than normal to prevent binding and restriction of circulation. Regular rest periods can be part of the routine job schedule. Employees who stand should be encouraged to sit or lie down to help reduce leg swelling, spinal shrinkage, and musculoskeletal disorders. Ergonomic and safety experts agree that while standing for work may be the best way to complete tasks, employers should implement measures that will maintain employees’ comfort and well-being. 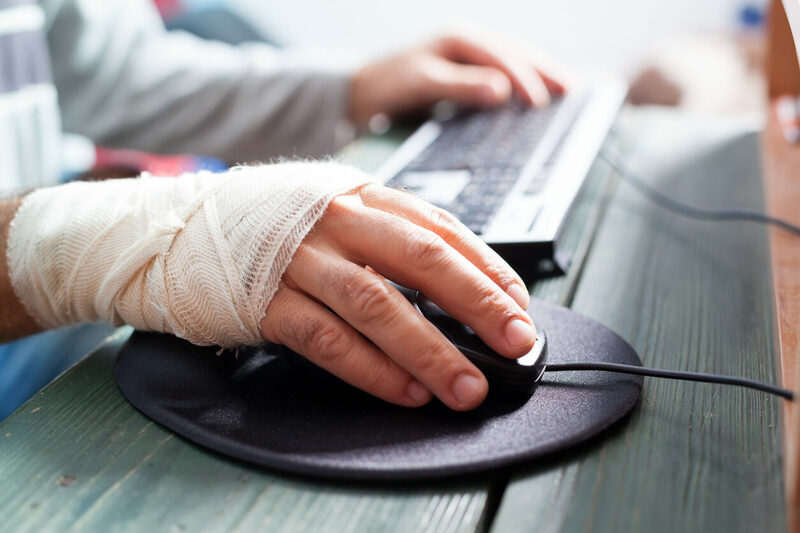 Preventing long-term health consequences is important for many business reasons, but investing in employee welfare with an ergonomics program can pay big dividends. Are standing desks better for you than sitting desks? Are standing desks better for employees than sitting desks?